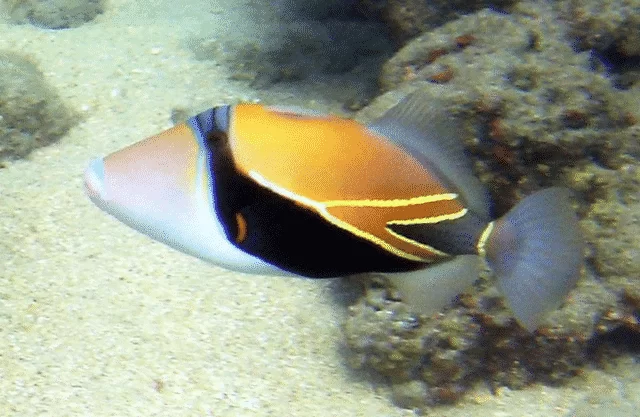 If you encounter a humuhumunukunukuapua’a while snorkeling in Hawaii, please give them their space. They can be quite territorial as we researched and learned after we shot the following video while snorkeling off Hawaii, the Big Island. One time I tried to register humuhumunukunukuapuaa.com as a domain name because I thought Kalanianaole@humuhumunukunukuapuaa.com would make a cool email address to tell people over the phone. Already taken? That’s too funny! Isn’t it such a feeling of accomplishment when you can finally say it! Janet – it is, indeed! I don’t know where the heck everyone in Hawaii learn the word. I think it may be the mandatory Hawaiian Languange classes forced upon kids uselessly in Kindergarten and like 3th Grade. It just makes logical sense to me. Maybe the frustration isn’t completely useless. I won a trip to Maui by knowing the name of the fish and I knew the name because I learned the words to “Little Grass Shack” by Don Ho when I was a teenager. On HBO Family, they play a story of how the “stripey-stripey-dashy-dashy-pig-face” got it’s name. That’s how I learned how to say it. haha achually it isn’t dat hard for us ta say da state fish’s name 😀 when u grow up round da language, culture and your whole family speaks nativly (even my howlie daddy throws some Hawaiian Slag here n there) it isn’t that hard to learn. Guess its jus like a russian speakin russian, or a mexican speaking and reading spanish. As a kamaaina friend explained it to my howlie-self when I was stationed on the island: “Iss easy, brah! Two humus, two nukus, and apua’a. Membah dat and you be speakin’ da kine in no time.” Humu, humu, nuku, nuku, apua’a. Lidat. What a concept. Also guys it haole not howlie and the language classes are not forced upon our keiki but provided to them just like with any other state curriculum it honors that cultural heritage of the area. Hawaiian history and culture is also taught again in middle and high school and is important not only to learn but to retain our identity as an island culture – remember No Hawaiian(s) = No Aloha ! I’m a hopeless haole, but in the town where I grew up there was a Hawai’ian family (Duvauchelles) and their daughter was my best friend in grade school. Very useful for future me since by the time I was 8 I was familiar enough with the language to pronounce things reasonably well on the first try, and I also had gotten fond of “exotic” (for a very white-bread town in the 60s) foods like dried squid and other fun tidbits. I never really developed a taste for poi, but I can cheerfully eat it. I ended up here while making sure I still remembered the fish name correctly. Funny, I was attacked by one once. They can be aggressive if you’re in their territory. It was very annoying as it kept at it for awhile! Breaking it down into three parts, as I have done above, makes learning the word slightly less difficult. humu humu, nuku nuku, apua – those are all also words in Finnish language. Those exact same words in Finnish would translate to “bustle bustle, sleep sleep, help” in English. Even the pronunciation of the words is exactly the same, except that in Hawaiian you say one more “a” in the end! Is September a good month to vacation in Hawaii?